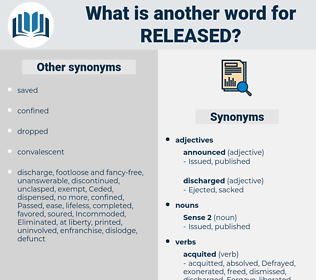 What is another word for released? releasing, mis, Issued, dismissed, Publications, dissemination. eased, liberalised, relaxed, revealed, Transferred, Resulted, disclosed, distributed, removed, Refused, dispersed, collapsed, implementation, advertised, restored, publicised, raised, circulated, addressed, rescued, Appeared, accused, lost, relieved, recovered, surrendered, Withdrew, cancelled, pre-published, Remanded, Liberalized, redeployed, started, Referred, reproduced, Responded, broadcasts, broadcasted, advised, discharges, Rendered, disregarded, declared, Testified, Leaked, Disagreed, Returned, spear, cleared, dispensed, forthcoming, shared, demonstrated, left, Served, exposed, aired, finalized, broke, Surfaced, repudiated, described, agreed, suggested, Emerged, implemented, shelled, Streamed, Generated, Refuted, sold, Drafted, allocated, registered, Helped, ordered, Reached, traveled, travelled, triggered, unsealed, unleashed, Embarked, Supplied, confused, called, diffuse, proclaimed, evacuate, Forwarded, Vacated, granted, Seemed, update, lance, presented, Argued, Displayed, Remitted, featured, ruled, led, Mobilized, Renounced, Instituted, detention, opposed, Occurred, Divulged, delayed, expressed, unveiled, sent, test-fired, tabled, Passed, Offered, Indicated, Wrote, Yielded, laid, spoke, Emanated, Performed, wrought, opened, Detained, Shunned, rolled, Was, Were, Sentenced, uncovered, showed, developed, Warned, communicate, Communicated, Carried, Deported, included, proved, Flashed, spent, smashed, Walked, exited, Filed, heard, received, blamed, played, drew, sowed, Told, identified, let, Exported, handed, conferred, unlocked, outlined, pointed, dropped, pronounced, abandoned, Followed, briefed, said, prepared, lifted, Tendered, informed, placed, turned, Commented, postponed, Contributed, awareness, Snapped, Lived, furnished, advanced, Sprang, Began, Came, Towards, listed, Submitted, conveyed, violated, Enacted, Lodged, Created, graduated, Pioneered, Undertook, highlighted, Deposited, directed, Promoted, Entered, Proceeded, posts, Brought, donated, condemned, Commenced, determined, drove, Mentioned, completed, Visited, topped, failed, Died, recorded, Provided, landed, paid, committed, edited, throw, Threw, Waged, product, Questioned, defeated, Deemed, engaged, attended, know, Claimed, stuck, Gave, cast, stated, reserved, hosted, Awarded, Had, found, chucked, Fought, Tossed, added, bet, Marched, Ran, Looked, Approached, quit, conducted, Went, voiced, decided, pulled, dumped, Took, welcomed, Discounted, Objected, mounted, Got, Meant, Voted, contested, kept, Acted, founded, Did, Became, thought, Issued, dismissed, discharged, dissemination. 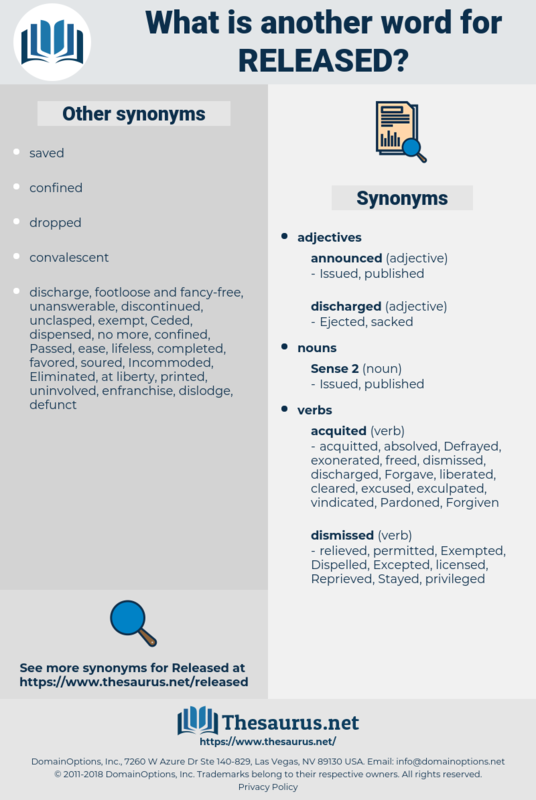 eased, realised, liberalised, Ceased, Erased, Arisen, relaxed, disenfranchised, revealed, re-established, restarted, relinquished, arrested, Transferred, Resulted, organised, elapsed, recognised, Reimbursed, disclosed, distributed, removed, proposed, Paroled, reissued, Refused, dispersed, rescheduled, Translated, advertised, commercialized, mobilised, pressed, realized, demobilised, imprisonment, restored, Disbursed, publicised, Repealed, reclaimed, raised, circulated, addressed, resolved, Appeared, authorised, lost, withdrawn, relieved, Canceled, Caused, recovered, surrendered, replaced, cancelled, Liberalized, declaration, Repaid, redeployed, started, recaptured, Spared, repaired, endorsed, Referred, disposed, Attributed, reproduced, practised, Ostracized, journaled, prepublished, broadcasted, advised, Resisted, Rendered, licensed, reintroduced, Retrieved, Administered, represented, dissipated, assembled, Stigmatized, detached, saved, loosened, Extradited, declared, refurbished, imposed, reflected, reopened, telecast, retired, Exercised, manufactured, Leaked, televised, downloaded, Extracted, learned, Arrived, concealed, separated, Returned, reviewed, statistics, cleared, Disengaged, dispensed, leave, absolved, shared, demonstrated, sparked, disabled, left, Served, exposed, aired, finalized, consolidated, unrestricted, depressed, renewed, Propagated, transit, Enabled, publicized, Captured, Surfaced, Perpetrated, Secreted, Displaced, Channelled, Discerned, repudiated, described, Transported, requested, Eliminated, suggested, Emerged, facilitated, implemented, retained, access, accessed, Investigated, Earmarked, stop, stopped, closed, acknowledged, Propelled, assigned, terminated, Explained, Generated, required, lowered, dissolved, discovered, understood, reprinted, imprisoned, sold, excused, Screened, tested, Inaugurated, Drafted, posed, allocated, registered, Enshrined, ordered, obliterated, considered, Reached, Worked, travelled, approved, triggered, Seconded, authorized, appropriated, disqualified, unsealed, diffused, Expelled, evacuated, unobstructed, unleashed, redeemed, deregulated, Embarked, recommended, activated, Supplied, Spilled, confused, called, healed, PUBL., reference, charged, Forwarded, empowered, updated, ensured, dispatched, Originated, vaporized, Vacated, Compiled, acquired, granted, Seemed, Penetrated, Slipped, Excluded, erupted, Assuaged, presented, Targeted, offloaded, moved, unapplied, handled, chosen, Operated, confiscated, felt, derived, Rebuffed, Displayed, stored, environment, located, Allowed, Revoked, pursued, Remitted, Rebutted, featured, tracked, ruled, decommitted, deactivated, secured, spurned, prescribed, led, unhindered, Broadened, allotted, Allayed, formulated, Levelled, earned, Renounced, positioned, forgotten, Forgot, Instituted, opposed, Contravened, suspended, Occurred, Stationed, elaborated, Marketed, Divulged, sought, foreseen, written, Hurled, Excreted, delayed, Managed, expressed, unveiled, sent, deposed, utilized, tabled, Passed, observed, Offered, reunited, demobilized, pubished, Indicated, accepted, spoken, seized, uninhibited, Installed, unrevealed, Complied, abducted, exchanged, associated, outstanding, traded, Yielded, Abolished, seat, laid, unimpaired, Poured, Radiated, permitted, Been, Performed, Filtered, decoupled, Shown, opened, rushed, Detained, diverted, anticipated, Waived, processed, covered, rolled, proven, Sentenced, uncovered, showed, jettisoned, entrusted, Evolved, planned, withheld, document, documented, developed, titled, weakened, communicate, Communicated, Carried, Deported, included, Accorded, Excavated, scheduled, proved, pledged, struck, refunded, affected, drawn, overcome, spent, ended, Happened, seen, admitted, exited, stemmed, Asked, imported, Filed, heard, unimpeded, concluded, unblocked, received, Afforded, action, blamed, Gazetted, deferred, sustained, played, projected, Adjourned, paved, collected, identified, mailed, Obtained, fulfilled, Supplemented, let, overturned, Exported, handed, Shipped, Examined, unimplemented, unlocked, kidnapped, employed, ignored, outlined, pointed, dropped, Polluting, pronounced, abandoned, Followed, said, commissioned, prepared, lifted, Tendered, fed, Shifted, informed, placed, turned, grown, Sprung, postponed, assisted, Begun, come, Contributed, judgement, entitled, enforced, vested, furnished, accompanied, sacked, advanced, Devolved, expanded, dictated, loaded, Consigned, Purged, unloaded, listed, judgment, Submitted, nominated, conveyed, violated, Enacted, Undertaken, Lodged, Ceded, Created, invited, Duplicated, Achieved, Challenged, graduated, barred, proceed, highlighted, Deposited, directed, Tripped, credited, Promoted, Upheld, marooned, Entered, Deleted, driven, Evicted, noted, posts, Brought, buried, stranded, authored, acquitted, donated, condemned, vented, flushed, determined, Exhibited, finished, forged, expected, Injected, Mentioned, completed, washed, contacted, quenched, built, designed, Visited, topped, failed, filled, recorded, thawed, Provided, landed, paid, undermined, bombed, have, thrown, Commanded, effected, Exempted, held, committed, edited, taught, ex, Waged, known, Forgiven, Questioned, defeated, given, exhausted, planted, routed, Deemed, engaged, Claimed, evidenced, 1998, detected, worn, maintained, stuck, Aimed, defined, extended, cast, stated, dismounted, plotted, Quoted, dedicated, Pushed, Awarded, Had, found, Enjoyed, destined, Subjected, run, Benefited, Fought, uploaded, added, attached, Omitted, Looked, gone, won, Viewed, divided, quit, conducted, intended, voiced, Mapped, missed, decided, Taxed, pulled, pinned, dumped, devoted, taken, hijacked, controlled, HIT, Discounted, focused, blocked, mounted, Got, formed, contested, kept, dated, continued, Acted, shed, Met, done, become, cut, freed, thought, Issued, dismissed, discharged, dissemination. My master once released, Lucas could not hurt him. It was Silas Blackburn who finally released the strain. reelect, rear light, reallocate, realised, realized, real estate, religious sect, royal society, relocated, relocate, relaxed, religiosity, ruralist, relict, realist, royalist, relegate.